In 2015, there were 136 reportable boating incidents, 77 injuries and 13 fatalities. Falling overboard was the leading cause of fatalities with 3 deaths attributed to it. The most common cause of injury accidents was operator inattention. The most dangerous lake for injury accidents last year was Center Hill Lake. Limit your alcohol intake if you are responsible for operating a boat or jetski. Alcohol and drug use was a primary cause in 5.1% of the accidents in 2015. This was increase from 2014 in which the percentage was 4.2. Wear a Coast Guard approved life vest if you are driving or riding a jetski, skiing, tubing, knee-boarding, etc. Keep life jackets within reach on a boat. Understand the dangers and be extra cautious. Saturday is the most dangerous day to be on the water, and the most dangerous time is from 4:00 to 8:00 p.m. Both of these stats are easy to understand: Saturday is dangerous because that is the busiest day on the lake and 4:00 to 8:00 pm. is dangerous because people have been on the water and in the sun all day and are likely tired and some are inevitably under the influence after drinking during the day. Be a vigilant driver. Watch not just for other boats and jet skis but also skiers and swimmers in the water. In the movies, people who are drowning often thrash about and scream. But in real life, drowning can happen quickly and without much of a scene. If someone in the water tells you they need help or seems to be in danger, do not assume they are joking. Help them immediately. Know the risks associated with carbon monoxide. For details on the subject, see our website page by clicking here. 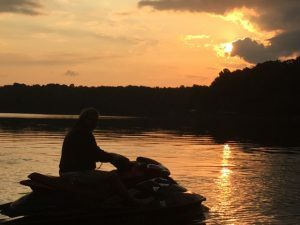 John and Joy Day spend a tremendous amount of time on Tims Ford Lake each summer. Weather permitting, John heads out on his jet ski every Saturday and Sunday morning at dawn for an hour and half ride while the lake is still and peaceful. And the family enjoys long boat rides, water-skiing, knee-boarding and tubing. So we understand the lake life. If you or a loved one has been injured while boating or jet skiing, you can talk with one of our award-winning lawyers for free. We will gladly review your case, answer your questions and explain your legal options without obligation. If we think we can help you and you decide to hire us, we handle all accident cases on a contingency basis so we only get paid if we win. To get started, give us a call at 615-742-4880 (Nashville) or 615-867-9900 (Murfreesboro) or toll-free from anywhere in the State of Tennessee at 866-812-8787. We have recovered millions for our satisfied clients and we are here to help you too.